This section includes tips and suggestions that we have from our experience using VoltMinder. Please send us yours and we will pass them along. The statements in this section refer to engines with generators or alternators. Batteries do go bad due to internal problems. VoltMinder will not fix this, but it will alert you when your battery may be experiencing a problem, so that you can get it replaced before it strands you. If you leave your lights on and VoltMinder's alarm sounds, you will notice that when you shut the lights off, the battery voltage will begin to rise and may even go above the alarm voltage level. This is normal when you have a short time heavy load discharge. If VoltMinder had not warned you, the battery would not have come back up because the lights would have been left on too long. In order to insure that your battery is fully charged, you should continue to run your engine until the battery is sufficiently charged. If your engine is running and the alarm sounds, this is probably an indication that either your battery has gone bad or your alternator has ceased to generate voltage. In this case, shut off all devices that draw power and have your vehicle serviced as soon as possible! The receptacle that you plug VoltMinder into should be within 1/10 of a volt of that of the battery voltage. 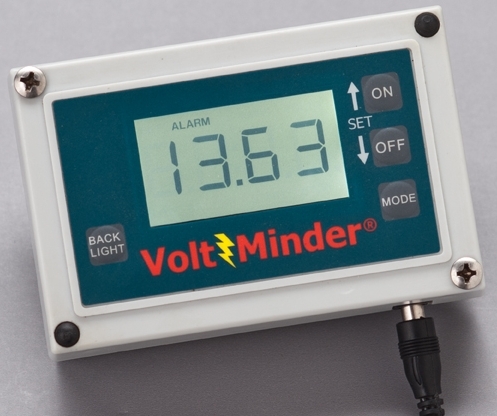 You can determine this by using a good-quality digital voltmeter. If the voltage is not within 1/10 of a volt of that of your battery, you will need to find a source that closer to the battery. VoltMinder will display the voltage of your battery.